Paul’s primary research interests focus on understanding the role of the marine carbon cycle within the Earth system. His multi-disciplinary background allows this to be tacked in a novel way. Paul’s degree and PhD were in the Department of Earth Sciences in Oxford, where working with Ros Rickaby, he examined ENSO change over the Pliocene, developed novel geochemical climate proxy techniques, and investigated the impact of ocean acidification on calcifying phytoplankton. After his PhD Paul moved to the Met Office Hadley Centre as a scientist, then senior scientist in ocean biogeochemical modeling. In the Hadley Centre Paul was heavily involved in the development, validation and application of the Earth System Model HadGEM2-ES. Working with this model, Paul and colleagues investigated the mechanisms behind novel biogeochemical climate feedbacks, the role of anthropogenic aerosols in recent climate change, reversibility in the earth system and more. 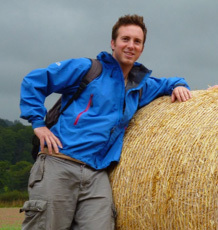 In 2013 Paul took up a lectureship in the School of Geography, University of Exeter, where he is working to unite past and future climate research to help improve our understanding of the Earth system. Please note that I am on shared parental leave from October to December. I will be in the office for short periods throught this leave, but please email me in advance to arrange meetings, and be prepared for a delay in my response. Booth BBB, Dunstone NJ, Halloran PR, Andrews T, Bellouin N (2012). Aerosols implicated as a prime driver of twentieth-century North Atlantic climate variability. Nature, 484(7393), 228-232. Aerosols implicated as a prime driver of twentieth-century North Atlantic climate variability. Systematic climate shifts have been linked to multidecadal variability in observed sea surface temperatures in the North Atlantic Ocean. These links are extensive, influencing a range of climate processes such as hurricane activity and African Sahel and Amazonian droughts. The variability is distinct from historical global-mean temperature changes and is commonly attributed to natural ocean oscillations. A number of studies have provided evidence that aerosols can influence long-term changes in sea surface temperatures, but climate models have so far failed to reproduce these interactions and the role of aerosols in decadal variability remains unclear. Here we use a state-of-the-art Earth system climate model to show that aerosol emissions and periods of volcanic activity explain 76 per cent of the simulated multidecadal variance in detrended 1860-2005 North Atlantic sea surface temperatures. After 1950, simulated variability is within observational estimates; our estimates for 1910-1940 capture twice the warming of previous generation models but do not explain the entire observed trend. Other processes, such as ocean circulation, may also have contributed to variability in the early twentieth century. Mechanistically, we find that inclusion of aerosol-cloud microphysical effects, which were included in few previous multimodel ensembles, dominates the magnitude (80 per cent) and the spatial pattern of the total surface aerosol forcing in the North Atlantic. Our findings suggest that anthropogenic aerosol emissions influenced a range of societally important historical climate events such as peaks in hurricane activity and Sahel drought. Decadal-scale model predictions of regional Atlantic climate will probably be improved by incorporating aerosol-cloud microphysical interactions and estimates of future concentrations of aerosols, emissions of which are directly addressable by policy actions. Halloran PR, Bell TG, Totterdell IJ (2010). Can we trust empirical marine DMS parameterisations within projections of future climate?. Biogeosciences, 7(5), 1645-1656. Can we trust empirical marine DMS parameterisations within projections of future climate? Dimethylsulphide (DMS) is a globally important aerosol precurser. In 1987 Charlson and others proposed that an increase in DMS production by certain phytoplankton species in response to a warming climate could stimulate increased aerosol formation, increasing the lower-atmosphere's albedo, and promoting cooling. Despite two decades of research, the global significance of this negative climate feedback remains contentious. It is therefore imperative that schemes are developed and tested, which allow for the realistic incorporation of phytoplankton DMS production into Earth System models. Using these models we can investigate the DMS-climate feedback and reduce uncertainty surrounding projections of future climate. Here we examine two empirical DMS parameterisations within the context of an Earth System model and find them to perform marginally better than the standard DMS climatology at predicting observations from an independent global dataset. We then question whether parameterisations based on our present understanding of DMS production by phytoplankton, and simple enough to incorporate into global climate models, can be shown to enhance the future predictive capacity of those models. This is an important question to ask now, as results from increasingly complex Earth System models lead us into the 5th assessment of climate science by the Intergovernmental Panel on Climate Change. Comparing observed and predicted inter-annual variability, we suggest that future climate projections may underestimate the magnitude of surface ocean DMS change. Unfortunately this conclusion relies on a relatively small dataset, in which observed inter-annual variability may be exaggerated by biases in sample collection. We therefore encourage the observational community to make repeat measurements of sea-surface DMS concentrations an important focus, and highlight areas of apparent high inter-annual variability where sampling might be carried out. Finally, we assess future projections from two similarly valid empirical DMS schemes, and demonstrate contrasting results. We therefore conclude that the use of empirical DMS parameterisations within simulations of future climate should be undertaken only with careful appreciation of the caveats discussed. © 2010 Author(s). Halloran PR, Hall IR, Colmenero-Hidalgo E, M Rickaby RE (2008). Evidence for a multi-species coccolith volume change over the past two centuries: Understanding a potential ocean acidification response. Biogeosciences, 5(6), 1651-1655. Major questions surround the species-specific nature of coccolithophore calcification in response to rising atmospheric CO2 levels. Here we present CaCO3 particle volume distribution data from the coccolith size-fraction of a rapidly accumulating North Atlantic sediment core. Without direct volume measurements on coccoliths produced by individual coccolithophore species, and knowledge of organic, as well as inorganic carbon production, it is not possible to state conclusively the coccolithophore calcification change at this site. However, by analysing the size distribution of CaCO3 particles in the less than 10. Iglesias-Rodriguez MD, Halloran PR, Rickaby REM, Hall IR, Colmenero-Hidalgo E, Gittins JR, Green DRH, Tyrrell T, Gibbs SJ, Von Dassow P, et al (2008). Phytoplankton calcification in a high-CO<inf>2</inf> world. Science, 320(5874), 336-340. Ocean acidification in response to rising atmospheric CO2 partial pressures is widely expected to reduce calcification by marine organisms. From the mid-Mesozoic, coccolithophores have been major calcium carbonate producers in the world's oceans, today accounting for about a third of the total marine CaCO3 production. Here, we present laboratory evidence that calcification and net primary production in the coccolithophore species Emiliania huxleyi are significantly increased by high CO2 partial pressures. Field evidence from the deep ocean is consistent with these laboratory conclusions, indicating that over the past 220 years there has been a 40% increase in average coccolith mass. Our findings show that coccolithophores are already responding and will probably continue to respond to rising atmospheric CO2 partial pressures, which has important implications for biogeochemical modeling of future oceans and climate. Rickaby REM, Halloran P (2005). Cool La Niña during the warmth of the Pliocene?. Science, 307(5717), 1948-1952. Cool La Niña during the warmth of the Pliocene? The role of El Niño-Southern Oscillation (ENSO) in greenhouse warming and climate change remains controversial. During the warmth of the early-mid Pliocene, we find evidence for enhanced thermocline tilt and cold upwelling in the equatorial Pacific, consistent with the prevalence of a La Niña-like state, rather than the proposed persistent warm El Niño-like conditions. Our Pliocene paleothermometer supports the idea of a dynamic "ocean thermostat" in which heating of the tropical Pacific leads to a cooling of the east equatorial Pacific and a La Niña-like state, analogous to observations of a transient increasing east-west sea surface temperature gradient in the 20th-century tropical Pacific. Reynolds DJ, Hal IR, Slater SM, Mette MJ, Wanamaker AD, Scourse JD, Garry FK, Halloran PR (2018). Isolating and Reconstructing Key Components of North Atlantic ocean Variability from a Sclerochronological Spatial Network. PALEOCEANOGRAPHY AND PALEOCLIMATOLOGY, 33(10), 1086-1098. Author URL. Full text. Reynolds DJ, Hall IR, Slater SM, Scourse JD, Halloran PR, Sayer MDJ (2017). Reconstructing Past Seasonal to Multicentennial-Scale Variability in the NE Atlantic Ocean Using the Long-Lived Marine Bivalve Mollusk. Glycymeris glycymeris. Paleoceanography, 32(11), 1153-1173. Full text. © 2016 the Author(s). Owing to the lack of absolutely dated oceanographic information before the modern instrumental period, there is currently significant debate as to the role played by North Atlantic Ocean dynamics in previous climate transitions (for example, Medieval Climate Anomaly-Little Ice Age, MCA-LIA). Here we present analyses of a millennial-length, annually resolved and absolutely dated marine δ 18 O archive. We interpret our record of oxygen isotope ratios from the shells of the long-lived marine bivalve Arctica islandica (δ 18 O-shell), from the North Icelandic shelf, in relation to seawater density variability and demonstrate that solar and volcanic forcing coupled with ocean circulation dynamics are key drivers of climate variability over the last millennium. During the pre-industrial period (AD 1000-1800) variability in the sub-polar North Atlantic leads changes in Northern Hemisphere surface air temperatures at multi-decadal timescales, indicating that North Atlantic Ocean dynamics played an active role in modulating the response of the atmosphere to solar and volcanic forcing. Séférian R, Gehlen M, Bopp L, Resplandy L, Orr JC, Marti O, Dunne JP, Christian JR, Doney SC, Ilyina T, et al (2016). Inconsistent strategies to spin up models in CMIP5: Implications for ocean biogeochemical model performance assessment. Geoscientific Model Development, 9(5), 1827-1851. During the fifth phase of the Coupled Model Intercomparison Project (CMIP5) substantial efforts were made to systematically assess the skill of Earth system models. One goal was to check how realistically representative marine biogeochemical tracer distributions could be reproduced by models. In routine assessments model historical hindcasts were compared with available modern biogeochemical observations. However, these assessments considered neither how close modeled biogeochemical reservoirs were to equilibrium nor the sensitivity of model performance to initial conditions or to the spin-up protocols. Here, we explore how the large diversity in spin-up protocols used for marine biogeochemistry in CMIP5 Earth system models (ESMs) contributes to model-to-model differences in the simulated fields. We take advantage of a 500-year spin-up simulation of IPSL-CM5A-LR to quantify the influence of the spin-up protocol on model ability to reproduce relevant data fields. Amplification of biases in selected biogeochemical fields (O 2 , NO 3 , Alk-DIC) is assessed as a function of spin-up duration. We demonstrate that a relationship between spin-up duration and assessment metrics emerges from our model results and holds when confronted with a larger ensemble of CMIP5 models. This shows that drift has implications for performance assessment in addition to possibly aliasing estimates of climate change impact. Our study suggests that differences in spin-up protocols could explain a substantial part of model disparities, constituting a source of model-to-model uncertainty. This requires more attention in future model intercomparison exercises in order to provide quantitatively more correct ESM results on marine biogeochemistry and carbon cycle feedbacks. Couldrey MP, Oliver KIC, Yool A, Halloran PR, Achterberg EP (2016). On which timescales do gas transfer velocities control North Atlantic CO<inf>2</inf> flux variability?. Global Biogeochemical Cycles, 30(5), 787-802. On which timescales do gas transfer velocities control North Atlantic CO2 flux variability? ©2016. American Geophysical Union. All Rights Reserved. The North Atlantic is an important basin for the global ocean's uptake of anthropogenic and natural carbon dioxide (CO2), but the mechanisms controlling this carbon flux are not fully understood. The air-sea flux of CO2, F, is the product of a gas transfer velocity, k, the air-sea CO2 concentration gradient, ΔpCO2, and the temperature- and salinity-dependent solubility coefficient, α. k is difficult to constrain, representing the dominant uncertainty in F on short (instantaneous to interannual) timescales. Previous work shows that in the North Atlantic, ΔpCO2 and k both contribute significantly to interannual F variability but that k is unimportant for multidecadal variability. On some timescale between interannual and multidecadal, gas transfer velocity variability and its associated uncertainty become negligible. Here we quantify this critical timescale for the first time. Using an ocean model, we determine the importance of k, ΔpCO2, and α on a range of timescales. On interannual and shorter timescales, both ΔpCO2 and k are important controls on F. In contrast, pentadal to multidecadal North Atlantic flux variability is driven almost entirely by ΔpCO2; k contributes less than 25%. Finally, we explore how accurately one can estimate North Atlantic F without a knowledge of nonseasonal k variability, finding it possible for interannual and longer timescales. These findings suggest that continued efforts to better constrain gas transfer velocities are necessary to quantify interannual variability in the North Atlantic carbon sink. However, uncertainty in k variability is unlikely to limit the accuracy of estimates of longer-term flux variability. Halloran P, Cox P (2015). Coral bleaching under unconventional scenarios of climate warming and ocean acidification. Nature Climate Change Full text. Halloran PR, Booth BBB, Jones CD, Lambert FH, McNeall DJ, Totterdell IJ, Völker C (2015). The mechanisms of North Atlantic CO<inf>2</inf> uptake in a large Earth System Model ensemble. Biogeosciences, 12(14), 4497-4508. © Author(s) 2015. The oceans currently take up around a quarter of the carbon dioxide (CO2) emitted by human activity. While stored in the ocean, this CO2 is not influencing Earth's radiation budget; the ocean CO2 sink therefore plays an important role in mitigating global warming. CO2 uptake by the oceans is heterogeneous, with the subpolar North Atlantic being the strongest CO2 sink region. Observations over the last 2 decades have indicated that CO2 uptake by the subpolar North Atlantic sink can vary rapidly. Given the importance of this sink and its apparent variability, it is critical that we understand the mechanisms behind its operation. Here we explore the combined natural and anthropogenic subpolar North Atlantic CO2 uptake across a large ensemble of Earth System Model simulations, and find that models show a peak in sink strength around the middle of the century after which CO2 uptake begins to decline. We identify different drivers of change on interannual and multidecadal timescales. Short-term variability appears to be driven by fluctuations in regional seawater temperature and alkalinity, whereas the longer-term evolution throughout the coming century is largely occurring through a counterintuitive response to rising atmospheric CO2 concentrations. At high atmospheric CO2 concentrations the contrasting Revelle factors between the low latitude water and the subpolar gyre, combined with the transport of surface waters from the low latitudes to the subpolar gyre, means that the subpolar CO2 uptake capacity is largely satisfied from its southern boundary rather than through air-sea CO2 flux. Our findings indicate that: (i) we can explain the mechanisms of subpolar North Atlantic CO2 uptake variability across a broad range of Earth System Models; (ii) a focus on understanding the mechanisms behind contemporary variability may not directly tell us about how the sink will change in the future; (iii) to identify long-term change in the North Atlantic CO2 sink we should focus observational resources on monitoring lower latitude as well as the subpolar seawater CO2; (iv) recent observations of a weakening subpolar North Atlantic CO2 sink may suggest that the sink strength has peaked and is in long-term decline. Kwiatkowski L, Yool A, Allen JI, Anderson TR, Barciela R, Buitenhuis ET, Butenschön M, Enright C, Halloran PR, Le Quéré C, et al (2014). IMarNet: an ocean biogeochemistry model intercomparison project within a common physical ocean modelling framework. Biogeosciences, 11(24), 7291-7304. Ocean biogeochemistry (OBGC) models span a wide variety of complexities, including highly simplified nutrient-restoring schemes, nutrient-phytoplankton-zooplankton-detritus (NPZD) models that crudely represent the marine biota, models that represent a broader trophic structure by grouping organisms as plankton functional types (PFTs) based on their biogeochemical role (dynamic green ocean models) and ecosystem models that group organisms by ecological function and trait. OBGC models are now integral components of Earth system models (ESMs), but they compete for computing resources with higher resolution dynamical setups and with other components such as atmospheric chemistry and terrestrial vegetation schemes. As such, the choice of OBGC in ESMs needs to balance model complexity and realism alongside relative computing cost. Here we present an intercomparison of six OBGC models that were candidates for implementation within the next UK Earth system model (UKESM1). The models cover a large range of biological complexity (from 7 to 57 tracers) but all include representations of at least the nitrogen, carbon, alkalinity and oxygen cycles. Each OBGC model was coupled to the ocean general circulation model Nucleus for European Modelling of the Ocean (NEMO) and results from physically identical hindcast simulations were compared. Model skill was evaluated for biogeochemical metrics of global-scale bulk properties using conventional statistical techniques. The computing cost of each model was also measured in standardised tests run at two resource levels. No model is shown to consistently outperform all other models across all metrics. Nonetheless, the simpler models are broadly closer to observations across a number of fields and thus offer a high-efficiency option for ESMs that prioritise high-resolution climate dynamics. However, simpler models provide limited insight into more complex marine biogeochemical processes and ecosystem pathways, and a parallel approach of low-resolution climate dynamics and high-complexity biogeochemistry is desirable in order to provide additional insights into biogeochemistry-climate interactions. Williams JHT, Totterdell IJ, Halloran PR, Valdes PJ (2014). Numerical simulations of oceanic oxygen cycling in the FAMOUS Earth-System model: FAMOUS-ES, version 1.0. Geoscientific Model Development, 7(4), 1419-1431. Addition and validation of an oxygen cycle to the ocean component of the FAMOUS climate model are described. At the surface, FAMOUS overestimates northern hemisphere oxygen concentrations whereas, at depth, the southern hemisphere values are too low. Surface validation is carried out with respect to HadGEM2-ES where, although good agreement is generally found, discrepancies are mainly attributed to disagreement in surface temperature structure between the models. The disagreement between the models at depth in the Southern Hemisphere is attributed to a combination of excessive surface productivity in FAMOUS' equatorial waters (and its concomitant effect on remineralisation at depth) and its reduced overturning circulation compared to HadGEM2-ES. For the Atlantic basin FAMOUS has a circulation strength of 12.7 ± 0.4 Sv compared to 15.0 ± 0.9 for HadGEM2-ES. Global- and basin-scale decomposition of meridional overturning circulation, oxygen concentration and apparent oxygen utilisation (AOU) - a measure of the departure from equilibrium with the atmosphere - allows specific features of the climatology to be assigned to particular basins. For example, the global signal in overestimation of low-latitude Northern Hemisphere oxygen at intermediate depths is attributed to the Pacific. In addition, the inclusion of the AOU analysis enables explanation of oxygen-deficient deep water in the Southern Hemisphere which is not seen in the Northern Hemisphere. © 2014 Author(s). Mumby PJ, Wolff NH, Bozec YM, Chollett I, Halloran P (2014). Operationalizing the resilience of coral reefs in an era of climate change. Conservation Letters, 7(3), 176-187. Ecosystem management frequently aims to manage resilience yet measuring resilience has proven difficult. Here, we quantify the ecological resilience of the largest reef in the Caribbean and map potential benefits of marine reserves under two scenarios of greenhouse gas emissions. Resilience is calculated using spatial ecological models and defined as the probability of a reef remaining in its coral-dominated basin of attraction such that it does not flip into an alternate, algal-dominated attractor. In practice, resilience is the probability that coral populations will maintain the ability to exhibit a recovery trend after acute disturbances such as hurricanes. The inputs required to estimate resilience are a reef's initial state, physical environment, and disturbance regime. One major driver of reef resilience is herbivory by parrotfish and recent action to protect parrotfish in Belize was found to have increased resilience 6-fold. However, the expected benefits of parrotfish protection to future coral cover were relatively modest with only a 2- to 2.6-fold improvement over a business-as-usual scenario, demonstrating how resilience and ecosystem states are decoupled. Global action to reduce greenhouse gas emissions had little impact on average coral state unless it was accompanied by local controls of fishing. However, combined global and local action reduced the rate of reef degradation threefold. Operationalizing resilience explicitly integrates available biophysical data and accommodates the complex interactions among ecological processes and multiple types of disturbance. © 2013 Wiley Periodicals, Inc.
Kwiatkowski L, Halloran PR, Mumby PJ, Stephenson DB (2014). What spatial scales are believable for climate model projections of sea surface temperature?. Climate Dynamics, 43(5-6), 1483-1496. What spatial scales are believable for climate model projections of sea surface temperature? Kennedy EV, Perry CT, Halloran PR, Iglesias-Prieto R, Schönberg CHL, Wisshak M, Form AU, Carricart-Ganivet JP, Fine M, Eakin CM, et al (2013). Avoiding coral reef functional collapse requires local and global action. Curr Biol, 23(10), 912-918. Avoiding coral reef functional collapse requires local and global action. Coral reefs face multiple anthropogenic threats, from pollution and overfishing to the dual effects of greenhouse gas emissions: rising sea temperature and ocean acidification. While the abundance of coral has declined in recent decades, the implications for humanity are difficult to quantify because they depend on ecosystem function rather than the corals themselves. Most reef functions and ecosystem services are founded on the ability of reefs to maintain their three-dimensional structure through net carbonate accumulation. Coral growth only constitutes part of a reef's carbonate budget; bioerosion processes are influential in determining the balance between net structural growth and disintegration. Here, we combine ecological models with carbonate budgets and drive the dynamics of Caribbean reefs with the latest generation of climate models. Budget reconstructions using documented ecological perturbations drive shallow (6-10 m) Caribbean forereefs toward an increasingly fragile carbonate balance. We then projected carbonate budgets toward 2080 and contrasted the benefits of local conservation and global action on climate change. Local management of fisheries (specifically, no-take marine reserves) and the watershed can delay reef loss by at least a decade under "business-as-usual" rises in greenhouse gas emissions. However, local action must be combined with a low-carbon economy to prevent degradation of reef structures and associated ecosystem services. Mora C, Wei CL, Rollo A, Amaro T, Baco AR, Billett D, Bopp L, Chen Q, Collier M, Danovaro R, et al (2013). Biotic and Human Vulnerability to Projected Changes in Ocean Biogeochemistry over the 21st Century. PLoS Biology, 11(10). Ongoing greenhouse gas emissions can modify climate processes and induce shifts in ocean temperature, pH, oxygen concentration, and productivity, which in turn could alter biological and social systems. Here, we provide a synoptic global assessment of the simultaneous changes in future ocean biogeochemical variables over marine biota and their broader implications for people. We analyzed modern Earth System Models forced by greenhouse gas concentration pathways until 2100 and showed that the entire world's ocean surface will be simultaneously impacted by varying intensities of ocean warming, acidification, oxygen depletion, or shortfalls in productivity. In contrast, only a small fraction of the world's ocean surface, mostly in polar regions, will experience increased oxygenation and productivity, while almost nowhere will there be ocean cooling or pH elevation. We compiled the global distribution of 32 marine habitats and biodiversity hotspots and found that they would all experience simultaneous exposure to changes in multiple biogeochemical variables. This superposition highlights the high risk for synergistic ecosystem responses, the suite of physiological adaptations needed to cope with future climate change, and the potential for reorganization of global biodiversity patterns. If co-occurring biogeochemical changes influence the delivery of ocean goods and services, then they could also have a considerable effect on human welfare. Approximately 470 to 870 million of the poorest people in the world rely heavily on the ocean for food, jobs, and revenues and live in countries that will be most affected by simultaneous changes in ocean biogeochemistry. These results highlight the high risk of degradation of marine ecosystems and associated human hardship expected in a future following current trends in anthropogenic greenhouse gas emissions. © 2013 Mora et al. Joos F, Roth R, Fuglestvedt JS, Peters GP, Enting IG, von Bloh W, Brovkin V, Burke EJ, Eby M, Edwards NR, et al (2013). Carbon dioxide and climate impulse response functions for the computation of greenhouse gas metrics: a multi-model analysis. ATMOSPHERIC CHEMISTRY AND PHYSICS, 13(5), 2793-2825. Author URL. Andrews OD, Bindoff NL, Halloran PR, Ilyina T, Le Quere C (2013). Detecting an external influence on recent changes in oceanic oxygen using an optimal fingerprinting method. BIOGEOSCIENCES, 10(3), 1799-1813. Author URL. Vancoppenolle M, Bopp L, Madec G, Dunne J, Ilyina T, Halloran PR, Steiner N (2013). Future arctic ocean primary productivity from CMIP5 simulations: Uncertain outcome, but consistent mechanisms. Global Biogeochemical Cycles, 27(3), 605-619. Net Arctic Ocean primary production (PP) is expected to increase over this century, due to less perennial sea ice and more available light, but could decrease depending on changes in nitrate (NO3) supply. Here Coupled Model Intercomparison Project Phase 5 simulations performed with 11 Earth System Models are analyzed in terms of PP, surface NO3, and sea ice coverage over 1900-2100. Whereas the mean model simulates reasonably well Arctic-integrated PP (511 TgC/yr, 1998-2005) and projects a mild 58 TgC/yr increase by 2080-2099 for the strongest climate change scenario, models do not agree on the sign of future PP change. However, similar mechanisms operate in all models. The perennial ice loss-driven increase in PP is in most models NO3-limited. The Arctic surface NO3 is decreasing over the 21st century (-2.3 ± 1 mmol/m3), associated with shoaling mixed layer and with decreasing NO3 in the nearby North Atlantic and Pacific waters. However, the intermodel spread in the degree of NO3 limitation is initially high, resulting from >1000 year spin-up simulations. This initial NO3 spread, combined with the trend, causes a large variation in the timing of oligotrophy onset - which directly controls the sign of future PP change. Virtually all models agree in the open ocean zones on more spatially integrated PP and less PP per unit area. The source of model uncertainty is located in the sea ice zone, where a subtle balance between light and nutrient limitations determines the PP change. Hence, it is argued that reducing uncertainty on present Arctic NO3 in the sea ice zone would render Arctic PP projections much more consistent. ©2013. American Geophysical Union. All Rights Reserved. Menary MB, Roberts CD, Palmer MD, Halloran PR, Jackson L, Wood RA, Müller WA, Matei D, Lee SK (2013). Mechanisms of aerosol-forced AMOC variability in a state of the art climate model. Journal of Geophysical Research: Oceans, 118(4), 2087-2096. Mechanisms of sustained multidecadal changes in the strength of the Atlantic Meridional Overturning Circulation (AMOC) are investigated in a set of simulations with a new state-of-the-art Earth system model. Anthropogenic aerosols have previously been highlighted as a potential mitigator of AMOC weakening. In this study, we explain the oceanic mechanisms behind how anthropogenic aerosols force a strengthening of the AMOC by up to 20% in our state-of-the-art Earth system model. This strengthening is driven via atmospheric circulation changes which subsequently modulate the salinity budget of the North Atlantic subpolar gyre. Gradual salinification occurs via increased evaporation and decreased fluxes of ice through the Fram Straits. A component of the salinification is a positive feedback from the AMOC bringing more saline water northwards from the subtropical Atlantic. Salinification of the subpolar gyre results in increased deep convection and a strengthening of the AMOC. Following a reduction in aerosol concentrations, the AMOC rapidly weakens, approximately 3 times faster than in the case where anthropogenic aerosol concentrations had never been increased. Similarities and differences with available observational records and long term reanalysis products are also discussed. Key Points Aerosols force a long term AMOC strengthening in HadGEM2-ES of ~3Sv This occurs via atmospheric circulation modulating the NA freshwater budget Independent ocean models and atmospheric analyses provide qualitative support ©2013. American Geophysical Union. All Rights Reserved. Bopp L, Resplandy L, Orr JC, Doney SC, Dunne JP, Gehlen M, Halloran P, Heinze C, Ilyina T, Séférian R, et al (2013). Multiple stressors of ocean ecosystems in the 21st century: Projections with CMIP5 models. Biogeosciences, 10(10), 6225-6245. Ocean ecosystems are increasingly stressed by human-induced changes of their physical, chemical and biological environment. Among these changes, warming, acidification, deoxygenation and changes in primary productivity by marine phytoplankton can be considered as four of the major stressors of open ocean ecosystems. Due to rising atmospheric CO2 in the coming decades, these changes will be amplified. Here, we use the most recent simulations performed in the framework of the Coupled Model Intercomparison Project 5 to assess how these stressors may evolve over the course of the 21st century. The 10 Earth system models used here project similar trends in ocean warming, acidification, deoxygenation and reduced primary productivity for each of the IPCC's representative concentration pathways (RCPs) over the 21st century. For the "business-as-usual" scenario RCP8.5, the model-mean changes in the 2090s (compared to the 1990s) for sea surface temperature, sea surface pH, global O2 content and integrated primary productivity amount to &plus;2.73 (±0.72) C,-0.33 (±0.003) pH unit,-3.45 (±0.44)% and-8.6 (±7.9)%, respectively. For the high mitigation scenario RCP2.6, corresponding changes are +0.71 (±0.45) C,-0.07 (±0.001) pH unit,-1.81 (±0.31)% and-2.0 (±4.1)%, respectively, illustrating the effectiveness of extreme mitigation strategies. Although these stressors operate globally, they display distinct regional patterns and thus do not change coincidentally. Large decreases in O2 and in pH are simulated in global ocean intermediate and mode waters, whereas large reductions in primary production are simulated in the tropics and in the North Atlantic. Although temperature and pH projections are robust across models, the same does not hold for projections of subsurface O2 concentrations in the tropics and global and regional changes in net primary productivity. These high uncertainties in projections of primary productivity and subsurface oxygen prompt us to continue inter-model comparisons to understand these model differences, while calling for caution when using the CMIP5 models to force regional impact models. © 2013 Author(s). Halloran PR (2012). Does atmospheric CO <inf>2</inf> seasonality play an important role in governing the air-sea flux of CO <inf>2</inf> ?. Biogeosciences, 9(6), 2311-2323. Does atmospheric CO 2 seasonality play an important role in governing the air-sea flux of CO 2 ? The amplitude, phase, and form of the seasonal cycle of atmospheric CO 2 concentrations varies on many time and space scales (Peters et al. 2007). Intra-annual CO 2 variation is primarily driven by seasonal uptake and release of CO 2 by the terrestrial biosphere (Machta et al. 1977; Buchwitz et al. 2007), with a small (Cadule et al. 2010; Heimann et al. 1998), but potentially changing (Gorgues et al. 2010) contribution from the ocean. Variability in the magnitude, spatial distribution, and seasonal drivers of terrestrial net primary productivity (NPP) will be induced by, amongst other factors, anthropogenic CO 2 release (Keeling et al. 1996), land-use change (Zimov et al. 1999) and planetary orbital variability, and will lead to changes in CO 2atm seasonality. Despite CO 2atm seasonality being a dynamic and prominent feature of the Earth System, its potential to drive changes in the air-sea flux of CO 2 has not previously (to the best of my knowledge) been explored. It is important that we investigate the impact of CO 2atm seasonality change, and the potential for carbon-cycle feedbacks to operate through the modification of the CO 2atm seasonal cycle, because the decision had been made to prescribe CO 2atm concentrations (rather than emissions) within model simulations for the fifth IPCC climate assessment (Taylor et al. 2009). In this study I undertake ocean-model simulations within which different magnitude CO 2atm seasonal cycles are prescribed. These simulations allow me to examine the effect of a change in CO 2atm seasonal cycle magnitude on the air-sea CO 2 flux. I then use an off-line model to isolate the drivers of the identified air-sea CO 2 flux change, and propose mechanisms by which this change may come about. Three mechanisms are identified by which co-variability of the seasonal cycles in atmospheric CO 2 concentration, and seasonality in sea-ice extent, wind-speed and ocean temperature, could potentially lead to changes in the air-sea flux of CO 2 at mid-to-high latitudes. The sea-ice driven mechanism responds to an increase in CO 2atm seasonality by pumping CO 2 into the ocean, the wind-speed and solubility-driven mechanisms, by releasing CO 2 from the ocean (in a relative sense). The relative importance of the mechanisms will be determined by, amongst other variables, the seasonal extent of sea-ice. To capture the described feedbacks within earth system models, CO 2atm concentrations must be allowed to evolve freely, forced only by anthropogenic emissions rather than prescribed CO 2atm concentrations; however, time-integrated ocean simulations imply that the cumulative net air-sea flux could be at most equivalent to a few ppm CO 2atm. The findings presented here suggest that, at least under pre-industrial conditions, the prescription of CO 2atm concentrations rather than emissions within simulations will have little impact on the marine anthropogenic CO 2 sink. © 2012 Author(s). CC Attribution 3.0 License. Boucher O, Halloran PR, Burke EJ, Doutriaux-Boucher M, Jones CD, Lowe J, Ringer MA, Robertson E, Wu P (2012). Reversibility in an Earth System model in response to CO<inf>2</inf> concentration changes. Environmental Research Letters, 7(2). We use the HadGEM2-ES Earth System model to examine the degree of reversibility of a wide range of components of the Earth System under idealized climate change scenarios where the atmospheric CO2 concentration is gradually increased to four times the pre-industrial level and then reduced at a similar rate from several points along this trajectory. While some modelled quantities respond almost immediately to the atmospheric CO2 concentrations, others exhibit a time lag relative to the change in CO 2. Most quantities also exhibit a lag relative to the global-mean surface temperature change, which can be described as a hysteresis behaviour. The most surprising responses are from low-level clouds and ocean stratification in the Southern Ocean, which both exhibit hysteresis on timescales longer than expected. We see no evidence of critical thresholds in these simulations, although some of the hysteresis phenomena become more apparent above 2×CO2 or 3×CO2. Our findings have implications for the parametrization of climate impacts in integrated assessment and simple climate models and for future climate studies of geoengineering scenarios. © 2012 IOP Publishing Ltd.
Good P, Caesar J, Bernie D, Lowe JA, van der Linden P, Gosling SN, Warren R, Arnell NW, Smith S, Bamber J, et al (2011). A review of recent developments in climate change science. Part I: Understanding of future change in the large-scale climate system. PROGRESS IN PHYSICAL GEOGRAPHY, 35(3), 281-296. Author URL. McNeall D, Halloran PR, Good P, Betts RA (2011). Analyzing abrupt and nonlinear climate changes and their impacts. WILEY INTERDISCIPLINARY REVIEWS-CLIMATE CHANGE, 2(5), 663-686. Author URL. Collins WJ, Bellouin N, Doutriaux-Boucher M, Gedney N, Halloran P, Hinton T, Hughes J, Jones CD, Joshi M, Liddicoat S, et al (2011). Development and evaluation of an Earth-System model-HadGEM2. GEOSCIENTIFIC MODEL DEVELOPMENT, 4(4), 1051-1075. Author URL. Kulmala M, Asmi A, Lappalainen HK, Baltensperger U, Brenguier JL, Facchini MC, Hansson HC, Hov, O'Dowd CD, Pöschl U, et al (2011). General overview: European Integrated project on Aerosol Cloud Climate and Air Quality interactions (EUCAARI)-integrating aerosol research from nano to global scales. Atmospheric Chemistry and Physics, 11(24), 13061-130143. In this paper we describe and summarize the main achievements of the European Aerosol Cloud Climate and Air Quality Interactions project (EUCAARI). EUCAARI started on 1 January 2007 and ended on 31 December 2010 leaving a rich legacy including: (a) a comprehensive database with a year of observations of the physical, chemical and optical properties of aerosol particles over Europe, (b) comprehensive aerosol measurements in four developing countries, (c) a database of airborne measurements of aerosols and clouds over Europe during May 2008, (d) comprehensive modeling tools to study aerosol processes fron nano to global scale and their effects on climate and air quality. In addition a new Pan-European aerosol emissions inventory was developed and evaluated, a new cluster spectrometer was built and tested in the field and several new aerosol parameterizations and computations modules for chemical transport and global climate models were developed and evaluated. These achievements and related studies have substantially improved our understanding and reduced the uncertainties of aerosol radiative forcing and air quality-climate interactions. The EUCAARI results can be utilized in European and global environmental policy to assess the aerosol impacts and the corresponding abatement strategies. © 2011 Author(s). Martin GM, Bellouin N, Collins WJ, Culverwell ID, Halloran PR, Hardiman SC, Hinton TJ, Jones CD, McDonald RE, McLaren AJ, et al (2011). The HadGEM2 family of Met Office Unified Model climate configurations. GEOSCIENTIFIC MODEL DEVELOPMENT, 4(3), 723-757. Author URL. Jones CD, Hughes JK, Bellouin N, Hardiman SC, Jones GS, Knight J, Liddicoat S, O'Connor FM, Andres RJ, Bell C, et al (2011). The HadGEM2-ES implementation of CMIP5 centennial simulations. GEOSCIENTIFIC MODEL DEVELOPMENT, 4(3), 543-570. Author URL. Tripati AK, Eagle RA, Thiagarajan N, Gagnon AC, Bauch H, Halloran PR, Eiler JM (2010). <sup>13</sup>C-<sup>18</sup>O isotope signatures and 'clumped isotope' thermometry in foraminifera and coccoliths. Geochimica et Cosmochimica Acta, 74(20), 5697-5717. Accurate constraints on past ocean temperatures and compositions are critical for documenting climate change and resolving its causes. Most proxies for temperature are not thermodynamically based, appear to be subject to biological processes, require regional calibrations, and/or are influenced by fluid composition. As a result, their interpretation becomes uncertain when they are applied in settings not necessarily resembling those in which they were empirically calibrated. Independent proxies for past temperature could provide an important means of testing and/or expanding on existing reconstructions. Here we report measurements of abundances of stable isotopologues of calcitic and aragonitic benthic and planktic foraminifera and coccoliths, relate those abundances to independently estimated growth temperatures, and discuss the possible scope of equilibrium and kinetic isotope effects. The proportions of 13C-18O bonds in these samples exhibits a temperature dependence that is generally similar to that previously been reported for inorganic calcite and other biologically precipitated carbonate-containing minerals (apatite from fish, reptile, and mammal teeth; calcitic brachiopods and molluscs; aragonitic coral and mollusks). Most species that exhibit non-equilibrium 18O/16O (δ18O) and 13C/12C (δ13C) ratios are characterized by 13C-18O bond abundances that are similar to inorganic calcite and are generally indistinguishable from apparent equilibrium, with possible exceptions among benthic foraminiferal samples from the Arctic Ocean where temperatures are near-freezing. Observed isotope ratios in biogenic carbonates can be explained if carbonate minerals generally preserve a state of ordering that reflects the extent of isotopic equilibration of the dissolved inorganic carbon species. © 2010 Elsevier Ltd.
Tripati AK, Eagle RA, Thiagarajan N, Gagnon AC, Bauch H, Halloran PR, Eiler JM (2010). C-13-O-18 isotope signatures and 'clumped isotope' thermometry in foraminifera and coccoliths. GEOCHIMICA ET COSMOCHIMICA ACTA, 74(20), 5697-5717. Author URL. Woodhouse MT, Carslaw KS, Mann GW, Vallina SM, Vogt M, Halloran PR, Boucher O (2010). Low sensitivity of cloud condensation nuclei to changes in the sea-air flux of dimethyl-sulphide. ATMOSPHERIC CHEMISTRY AND PHYSICS, 10(16), 7545-7559. Author URL. Halloran PR, Rust N, Rickaby REM (2009). Isolating coccoliths from sediment for geochemical analysis. Geochemistry, Geophysics, Geosystems, 10(3). Trace element analysis of open-marine sedimentary carbonates provides a wealth of paleoclimate data. At present, the majority of this data is obtained from foraminifera tests. Complications regarding the variability of conditions experienced by foraminifera throughout test formation and the influence of diagenetic processes on sample chemistry limit the value of foraminifera samples in certain situations. Coccoliths, the calcium carbonate plates produced by coccolithophores, represent a second major pelagic open-marine carbonate source with the potential to provide a wide range of valuable trace element proxy data but which have, until now, been unavailable for analysis of many trace elements because of clay contamination. Here we describe a novel technique, which utilizes fast sorting flow cytometry, to enable the production of clay-free sedimentary coccolith samples. © 2009 by the American Geophysical Union. Iglesias-Rodriguez MD, Buitenhuis ET, Raven JA, Schofield O, Poulton AJ, Gibbs S, Halloran PR, De Baar HJW (2008). Response to comment on "Phytoplankton calcification in a high-CO <inf>2</inf> world". Science, 322(5907). Response to comment on "Phytoplankton calcification in a high-CO 2 world"
Recently reported increasing calcification rates and primary productivity in the coccolithophore Emiliania huxleyi were obtained by equilibrating seawater with mixtures of carbon dioxide in air. The noted discrepancy with previously reported decreasing calcification is likely due to the previously less realistic simulation of bicarbonate due to addition of acid or base to obtain simulated future CO2 partial pressure conditions. Hermoso A, Minoletti F, Rickaby REM, Halloran P (2008). Determination of differential vital effects for some Neogene calcareous nannoplankton taxa. Author URL. Rickaby REM, Hendry K, Young J, Halloran P (2008). Perturbing phytoplankton: a polar view on anthropogenic change. Author URL. Halloran P, Rickaby REM (2006). Separating the coccoliths from the clays and unlocking new trace metal proxies. Author URL. GEO2309: Physical Geography Practice. Research skills.